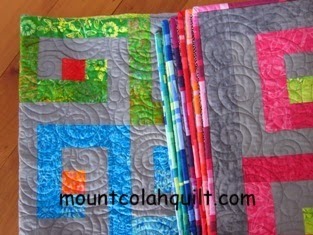 I handed my quilt to the organiser of the Sydney Quilt Show this afternoon. It's a kind of log cabin quilt. 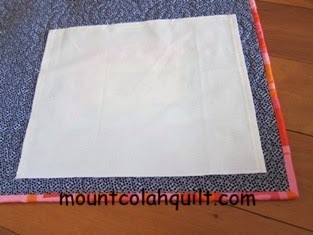 This year, the quilt label must be covered or the quilt will be ineligible for judging. I'm obliged to comply although I don't think my quilt is a winning kind. 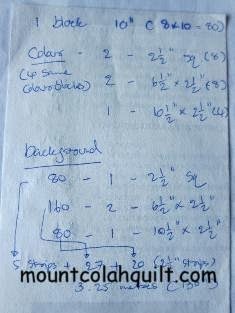 I make a quilt for practical use, and not so much for keeping or to be put away as a precious item.! Did you have fun at the show? I was in quilt heaven (didn't enter this year ... maybe next year). 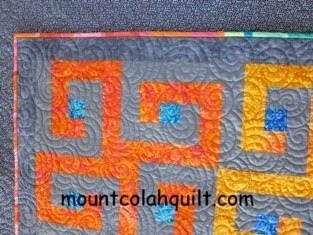 Love the quilting on your quilt, yes it does break up the straight lines nicely and give it an organic element. Thanks, Jenni, for your complements. 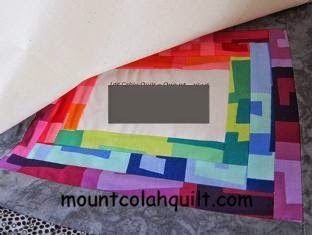 :-) I enjoyed the process of making the quilt very much. I just made it to see my quilt hung there today, the last day of the Show.! It was a fun day out.